The Nun is a good horror movie that can give you the chills before you sleep at night. I recommend that you watch this movie in the morning when it’s way too early to go to bed. After watching it, hit the gym so that you’ll be all tired and sleepy when you get home. A good way to knock you out immediately when you lay on your bed and not think about demonic nuns lurking in the shadows of your room. Well basically it uses the old jump-scare tactic quite a lot. It’s almost predictable every time it’s about to happen. You see the main character walking alone in the dark, the moment gets built up when the audience sees something creepy at the corner of the screen, then BOOM! The demon nun surprise attacks out of nowhere. Though this is a by-the-book horror movie trick, The Nun executes this perfectly. The movie also heavily uses the power of light and dark contrasts. You’ll feel fear when the scenes are in the dark, as it’s also where most of the scary things occur. And you’ll feel at ease when in light, like at the beginning and at the end of the movie when the lead characters think “it’s” all over. The Nun is the fifth installment in The Conjuring Universe which explains the origins of Valak, a powerful demon that’s in need of a human body as a host. Valak first appeared in Conjuring 2 as the deity that was successfully sent back to hell by the paranormal investigators Ed and Lorraine Warren. We found out in the movie that Valak was actually summoned from hell by a man who was into the occult during the middle ages in Romania. A portal was opened for the demonic deity to venture into earth but the demon was later suppressed by the knights of the church and its portal was successfully closed. The castle from where this happened became a convent of cloister nuns who swore an oath to make sure the portal remains closed and hidden from the public. But during World War 2, the havoc caused by aerial bombings reopened the gates of hell once more, releasing Valak. It was only a matter of time for the nuns to be haunted and killed off one by one. 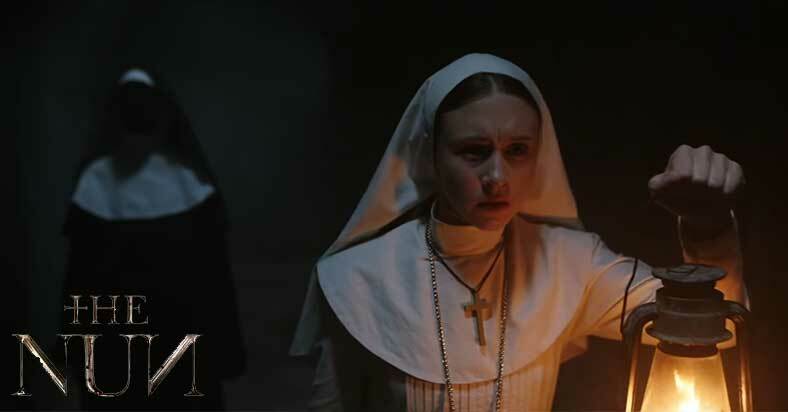 When the corpse of the last nun who committed suicide was discovered, a priest and a novitiate nun was sent by the Vatican to investigate the eerie nature behind her death. During production of the movie, the set was blessed by a Roman Catholic clergyman.